The Bible never refers to "Him" as "it." "Parakletos" = Helper, Intercessor, Consoler, Advocate, or Comforter! The Church is better now with the Holy Spirit present than when Jesus was on this earth, explaining the scriptures to us, preaching the gospel, healing the sick, casting out demons and raising the dead! The Holy Spirit is the One who convicts us of sin and brings us to Christ! He convicts or convinces us that Jesus has paid for our sin in full and that we are now righteous by His grace! The Holy Spirit convicts or convinces us that Satan, who WAS the ruler of this world, has been judged and cast out! He is a kind, compassionate, gentle, sensitive, wonderful person! He is the only one who can empower us to win the whole world to Christ and Satan knows it, so he makes the Church afraid of Him. Don’t let an abuse or a misuse of one of the gifts cause you to shy away from a full experience and a daily walk with the Holy Spirit. 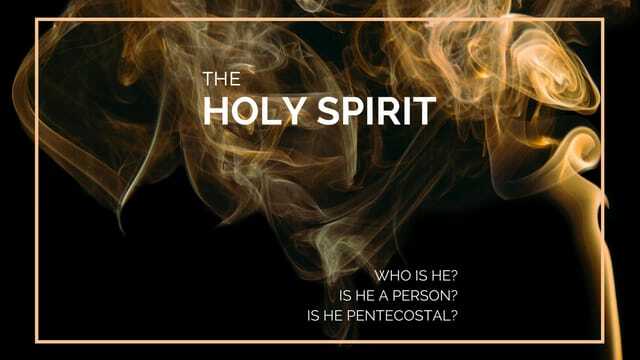 The Father, Son, and Holy Spirit all serve each other and defer to one another! Be informed of the financial position of the church and of decisions made by the Council of Elders the previous calendar year. Anyone may attend the meeting, but only official active members of Love Joy, age 18 and older, can vote. Members get to affirm Jonathan Burgio, elders and constitutional changes. So come on out and enjoy a slice of pizza after the meeting. All ladies welcome to come to our last lunch get-together before summer. We will meet at Zoe's Restaurant, 5711 Transit Rd, Williamsville, near Maple on Friday, May 29 at 12pm. Any questions, please call Linda Palm, 684-8289 or Kathy Knoll, 400-4415. Hope so see you there! Delicious Spaghetti lunch will be served on Sunday June 4th after the service. Spaghetti with meat sauce, bread and drink are all included for $9 adult, $5 child or $25 family maximum. Please reserve your place by signing up in the lobby today. All the proceeds benefit the Youth Summer Camping Trip. Come and celebrate Jonathan Burgio's Official Ordination at our First Wednesday service on June 7 from 7pm to 8:30pm. Dessert & Coffee reception to follow. Our Next Step 'one day' class will help you get a feel for what Love Joy is all about! Connect, Grow, Serve & Influence. Learn more about God, about yourself and how to serve the world! Please sign up at the Welcome Center. Childcare & light refreshments available.